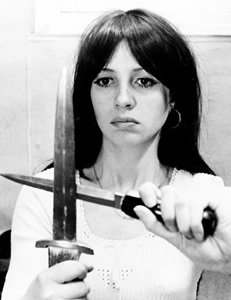 Juliet Berto (16 January, 1947 – 10 January, 1990) was the wide-eyed, gamine actress, whose quirky, but earnest charm, epitomized the ‘spirit of 68’ in a series of Jean-Luc Godard films in the late 1960s. She later starred in Jacques Rivette’s epic Out 1 (1971) and fantastical Celine et Julie Vont en Bateau (Celine and Julie Go Boating, 1974). In the 1980s she moved into writing and directing before her premature death at the age of 42.